Now available on Blu-Ray + DVD Combo Pack in stores. 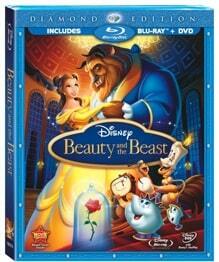 I remember watching Beauty and the Beast on VHS when it first came out in 1992. I was 14 years old and loved it back then. Now that I am older, nothing has changed. I am still enchanted by this Disney classic! The story remains the same, but the picture is MUCH sharper and the sound is crisper. It was a whole new experience to watch it on our big screen TV…like being in a movie theatre! Technology has come a long way since 1992! I was singing along to all the songs in the movie and annoying John because I don’t sing that well! 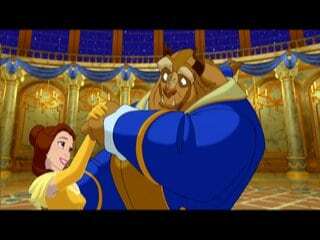 Can you believe he has NEVER seen Beauty in the Beast before? This was his first time seeing it! I was in shock since I thought everyone had seen this wonderful movie, but I guess I was wrong. He also enjoyed it and said he can see why it is a classic. He got a kick out of the music and talking household objects. He recognized the voice of Jerry Orbach who used to star on Law & Order and has since passed away. He played the voice of Lumiere. 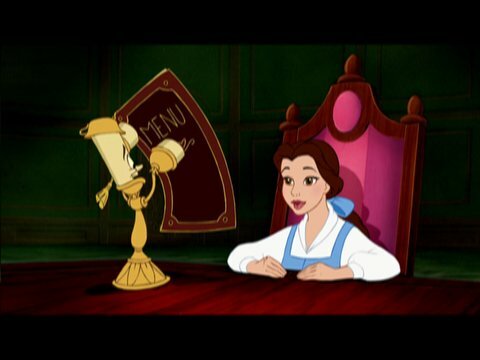 I am a sucker for a love story so I enjoyed the scenes with the Beast and Belle. I knew what lay under that tough exterior of the Beast. Even though I knew how it ended, I was still on the edge of my seat worried they wouldn’t break the curse in time! Of course, its a fairy tale with a happy ending, but there were some scary parts in the movie. It is a kid’s movie, but the younger kids may find it scary. My girls both enjoyed it though, but they are a little older. If you haven’t seen it, then you are missing out. I recommend picking it up and watching it. If you have seen it, buy the new Diamond Edition DVD + Blu-Ray and enjoy the film and all the extras! Download Beauty & the Beast colouring pages and activities. 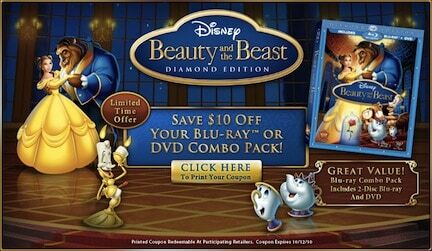 Get a coupon for $10 off the Blu-ray + DVD Combo Pack for this release from Disney Movie Rewards. I LOVED this movie and can’t wait to share with my kids. I love this one, too!! Though I’m surprised they didn’t wait to put in on Blu-ray until the 3D version is in theatres again, like what they did with The Lion King. I’m going to have to ask for this one for Christmas!